You are here: Home > (Update: Technical Error) Dell Streak 7 Pricing Leaked? (Update: Technical Error) Dell Streak 7 Pricing Leaked? Update: I just received an email from T-Mobile stating this pricing was the result of a technical error and is incorrect. They will be sharing pricing and availability details soon! If you like the Dell Streak 7, and maybe you should, then you will be happy to hear what we have for you today. 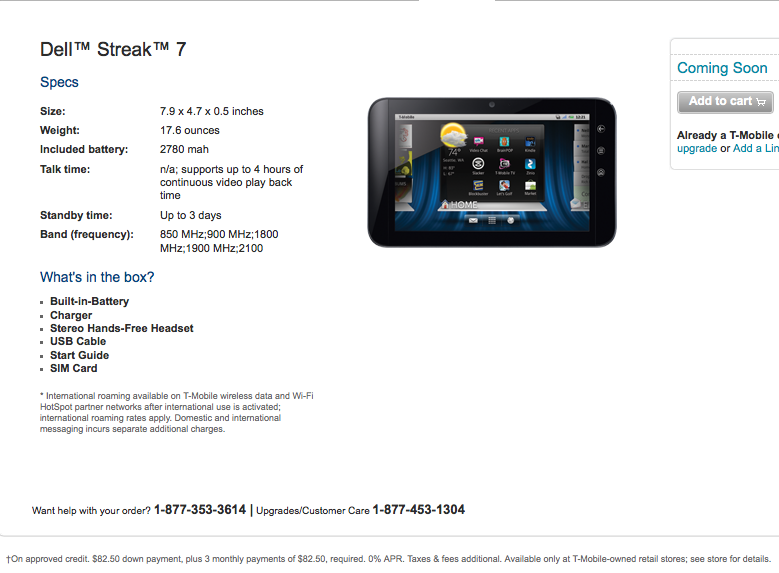 According the T-Mobile, the “Dell Streak 7 will push the limits on tablet affordability with a very competitive price”. More to the point, the price may have been leaked, prematurely I may add, by Dell and T-Mobile themselves. They are saying, if you can read the fine print at the bottom of the picture above, that it will be a “$82.50 down payment, plus 3 monthly payments of $82.50 required.” So $330. Nice. I’ll take two. What say you? Is that on contract with a data plan? I could probably live with this Wi-Fi and the occassional tether to my phone … I don’t want a 2nd data plan. Yeah you can see on the edge of the graphic, that they’re asking if you’re already a T-Mo customer to qualify for an upgrade or add-a-line. I knew that I had read that on the website. And then all of a sudden it was gone. If they had a wifi-only version, I’d pick one up at that price. Already having an Android device with 3G speed, I imagine tethering an Android tablet would be hard(er) for T-Mobile to detect, but I can’t justify paying for two data plans. Wifi only versions will most likely be OEM only. You arent going to find one at a carrier store. Look to dell to offer one maybe 50$ less wifi only if at all. BB playbook and Ipad are looking to be the only WIFI only devices for now. there is always the gtab…..
That’s the price of financing it. They add a percentage to the price of the device for the financing agreement. YOU SEEN? ?, how about you SAW, SAW SAW SAW. Jesus H. Christ. Did anyone else notice that the 1700 MHz band wasn’t listed? Does 2100MHz also provide 3G for T-Mobile, I can’t remember. AWS consists of both 1700MHz and 2100MHz, although the latter’s is slightly different and thus incompatible than the Eurasian one. How much will be without contract? This is the two year contract price. It is still on the website. If you look at the Galaxy Tab, it says $100 with three $100 payments. The Galaxy is $350 after MIR so maybe this will be $280 after MIR? Either that or they just want to dump the rest of their soon to be discontinued Galaxy Tabs first. Can you make phonecalls with this tablet? Like a cell-phone?